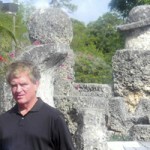 Coral Castle: The Mystery of Ed Leedskalnin and his American Stonehenge is the first book to take an objective, journalistic look at one of America’s most intriguing places — Coral Castle, located in Homestead, Florida, thirty miles southwest of Miami. It was built in the 1920s and ’30s by an eccentric Latvian immigrant named Edward Leedskalnin. He worked alone with primitive tools. He quarried, carved, and set in place more than 1,100 tons of coral rock, creating what is commonly known as the American Stonehenge. How he accomplished this amazing feat remains a mystery. Some believe he was simply a talented stonemason and engineer. Many others believe he had somehow harnessed anti-gravity powers, which allowed him to lift and move the stones as if by magic. Several books have been written on Ed’s other-worldly powers, and he has become a cult figure to those who believe in extra-terrestrials and in the magnetic grid theory. Skeptics have argued against these theories in magazine articles and on websites. 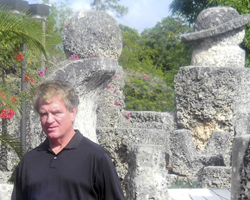 In Coral Castle, Rusty McClure and Jack Heffron survey the theories and interview experts on all sides of the argument, bringing this fascinating tale to a mass audience for the first time. Rusty McClure, is one of the New York Times best-selling authors of Crosley: Two Brothers and a Business Empire that Transformed The Nation and Cincinnatus: The Secret Plot To Save America, a novel that features Coral Castle. He has a Master of Divinity degree from Emory University and a Harvard MBA. An advisor and investor in numerous entrepreneurial projects, Rusty teaches the entrepreneurial course at Ohio Wesleyan University. He resides with his wife and daughters in Dublin, Ohio. Jack Heffron, has written several books of instruction for writers as well as numerous articles for magazines, primarily on travel, sports, and popular culture. His work has been noted in Best American Travel Writing and has won awards from the Society of Professional Journalists and Authors. His column in Cincinnati magazine recently was chosen as the best in Ohio by the Cleveland Press Club. His short stories have appeared in many literary magazines and twice have been nominated for the Pushcart Prize. He has taught at writers’ conferences throughout the country and lives in Cincinnati, Ohio. TO PURCHASE YOUR OWN COPY OF THIS VERY SPECIAL BOOK, PLEASE CALL THE CORAL CASTLE OR VISIT OUR GIFT SHOP.